Many Noble Homes are single story structures, which are the easiest and simplest to assemble. However, some building sites and peoples' needs just require a two story house, something very common and familiar to all of us. The building sites that most beg for a two story Noble Home are steeply sloped ones. In fact, all of the two story Noble Homes to date have been built, not on, but into a hill, and most of these have been on sites that slope down away from the road. This means entry is on the second floor of the house with sleeping areas downstairs: not quite so common and familiar as the traditionally styled homes of our parents or grandparents. However, this configuration really works and is preferable on many levels: the practical, aesthetic, and emotional. As a matter of practicality, entering into the house on the level where boots and coats are kept, where kitchen supplies are stored and used makes sense. If one is living on a hillside, there are usually views to be enjoyed, and they are best on the upper floor. Wouldn't you want to enjoy those through the course of the day, and when guest are visiting? It seems a waste to have the best views relegated to bedrooms. Additionally, with Noble Homes, the signature cathedral wood ceiling with the exposed trusses, natural lighting and soaring space is much more conducive to daytime work and entertainment. Conversely, downstairs bedrooms appeal to our deep seated emotional past, particularly when they are nestled into the hillside. It is quieter, darker, less exposed and safer. A natural cocoon. 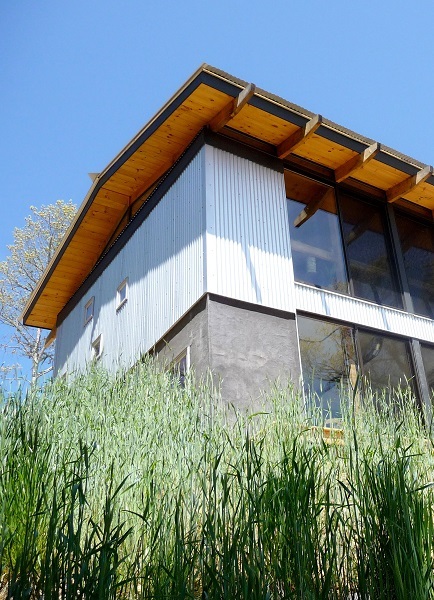 One can quickly see how this “upside down” layout is best use of a two story hillside home.